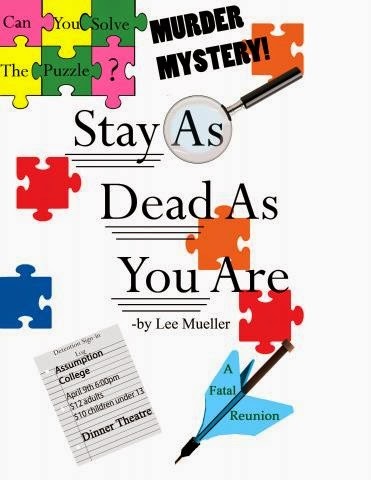 Assumption College School in Brantford, Ontario will present the murder mystery comedy "Stay As Dead As You Are" on April 9th at 6 pm. Interact with the cast and indulge in a 4 course meal. Treat your palate to a roasted chicken quarter dinner with roasted potatoes, mixed veggies, garden salad with tomato and cumber- Italian dressing with warm brownie and ice cream for dessert! Catered by students of the "Hungry Lion". Cost is $12 for adults and $10 for children under 13. Tickets close by April 2nd! Dinner and the show is April 9th starting at 6p.m. Seating is limited, so get your tickets NOW! Call the school for more details and ask to speak with Mrs. Ratelband at (519)751-2030 ext. 445.